At some point most football fans will have heard that "competition for places" is a good thing in football, but rarely will they have had the opportunity to witness it in action, unfolding before their eyes as clearly as it currently is at Bayern Munich. Thomas Müller is the case in point. By his own admission, the 2016/17 campaign was not the best for the Germany international. "Both the club and Thomas agree on the assessment of last season - it wasn't a good one," Bayern CEO Karl-Heinz Rummenigge told German newspaper Sport Bild recently. Following a draining UEFA EURO 2016 tournament with Germany, Müller struggled for form and ended up scoring just five Bundesliga goals in 2016/17. And although the 27-year-old also contributed an impressive 12 assists, he played the full 90 minutes just 20 times in the league. 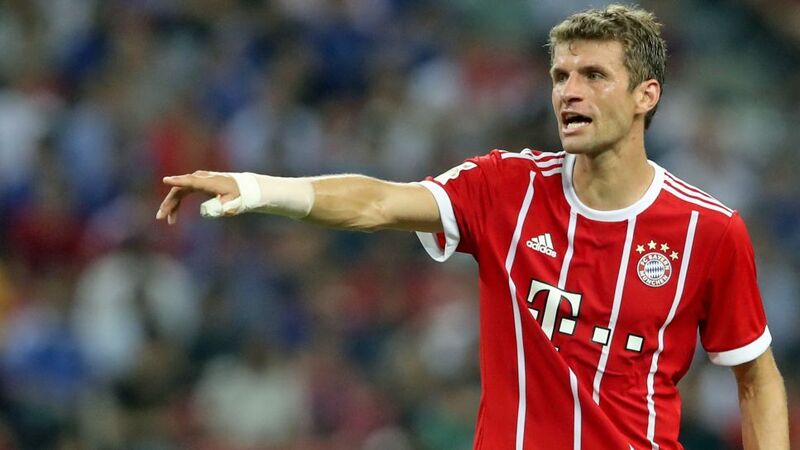 That return was perceived to be somewhat disappointing, especially as Müller had set the bar so high in 2015/16 by smashing in 20 Bundesliga goals and providing seven assists. "Thomas knows he has to deliver a bit more," Rummenigge added. He has been doing just that in pre-season. Müller grabbed three assists in a 9-1 friendly win over FSV Erlangen-Bruck, scored a superb opener in the 2-0 Telekom Cup final triumph over Werder Bremen and struck a brace – including a long-range beauty – in a 3-2 victory against Chelsea in Singapore. So what has prompted the upturn in form? Is it that a player of his quality would always come good sooner or later? Has he been helped by a long summer break that did not involve playing at the FIFA Confederations Cup 2017? Is he motivated to play more regularly in a World Cup year? Or has the arrival of fellow attacking midfielder James Rodriguez spurred him on to keep his place in the side? The answer is probably a little bit of everything, although none of the factors are mutually exclusive. An extended rest has undoubtedly done him good, but James' move to Munich seems to have been the catalyst Müller needed to get back to his best. After all, the Colombian has got the better of Müller once already. He beat him to the Golden Boot award at the 2014 FIFA World Cup by finishing as top scorer with six goals to Müller's five. Furthermore, the technically gifted attacker, who also has excellent movement and a fierce shot, is liked by head coach Carlo Ancelotti, with Rummenigge confirming upon James' arrival that "he was Carlo's biggest wish". Nevertheless, Ancelotti insisted that he will select players on merit, saying at a recent press conference: "We didn't buy James to replace anyone; we bought him to have a better team. James […] has no place guaranteed from me. If he deserves to play, he will play." The same is no doubt true for everyone in the squad, forcing Müller to react. And he cannot afford to ease up either, especially as Thiago and even Arturo Vidal are also able to play in the creative role just behind Robert Lewandowski. Although Müller often comes across as a laid-back, jovial character, he is also a fierce competitor eager to play and win. And if he continues to show the same form he has demonstrated in pre-season, Ancelotti will face a very tough choice when he comes to choose his starting line-up on Matchday 1 against Bayer Leverkusen on 18 August. Do you know your Thomas from your Gerd Müller? Well test your Thomas Müller knowledge with our quiz!